There were a few tense hours before President Trump's First Address to Congress. All news outlets were claiming the president would call for an immigration bill in which both sides would be asked to compromise. Like many legal immigrants, I'm an immigration restrictionist. As soon as open-border enthusiasts discover this; they tell me to go back whence I came (Canada and before that South-Africa), the idea being that I'm not suited to join "the nation of immigrants." Agreed. I'll save them the effort. Americans have little use for a scribe with a love of the English idiom and an oddball, annoying attachment to the American ideas of limited government and self-governance. You wouldn't want to import too many such subversives, who'll agitate for the values that made us great and will MAGA. "What is missing in this conversation is the fact that not all immigrants are the same. Immigrants from certain countries go on welfare overwhelmingly. Many Latin American countries send us immigrants who go on welfare. The question is, does the United States need massive new numbers of the low-skilled immigrants in a post-industrial economy? Is that good for the United States? Is it not mindless to say all immigrants are good? They are not. Some are, some aren't. ... the Republican Party ought to be courageous enough to draw the distinction between people who add to the sum total of the American economy, who buy into the culture, who improve the country, and those who don't. And there is a difference. Sorry." Thank you, Tucker Carlson, for being, I believe, the first famous pundit to doff the proverbial hat to those high-value immigrants who not only talk the American creed, but live it; the kind who subsidize the largess Republican turncoats seem so eager to dispense. Judging by the mirth among good people and the misery among the bad, the president has already made progress. It's just over a month into his presidency and the deportations of illegal immigrants are proceeding swimmingly. The morale among Immigration and Customs Enforcement (ICE) has never been higher. Their jobs are becoming "fun, again," lamented a New York Times reporter, whose job has become a living hell. Joy! Some anonymous informants for the newspaper-of-record within ICE say they miss the days of doing diaper duty. 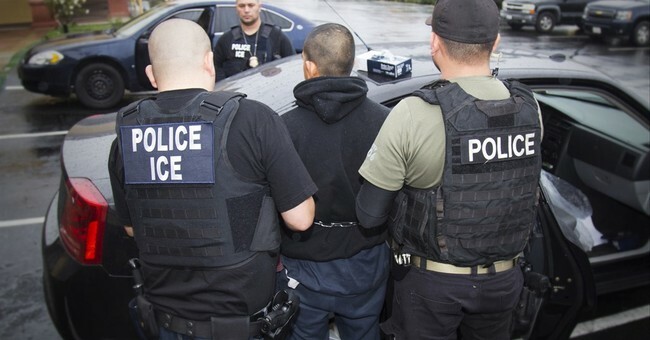 In 2012, following Barack Obama's reelection, the men of ICE were forced to babysit Central American minors who rushed the South-Western border, "for the DREAM Act." (All you need to know about the Development, Relief, and Education for Alien Minors Act is that it culminates in Green Cards and citizenship for millions of Democrats.) ICE was charged with minding the minors before escorting them in style to their destinations in the interior. Most agents are, however, over the moon about enforcement. ICE agents "are predominantly male, and have often served in the military, with a police department or both." While working without women could predispose them to happiness, the agents are likely just overjoyed because President Trump has let them do their job! By upholding the moral order, President Trump is also restoring the natural order, inverted by his predecessors. The feminist order of Obama had humiliated thousands of American men-of-action by turning them into wet-nurses. Obama messed with their biology. Men who think of themselves as protectors resent looking like child minders. Dead ringer "W," currently being rehabilitated by certain conservatives, was more "manly" in the way he emasculated these men. In 2005, George Bush indicted and viciously prosecuted two border-patrol agents, Ignacio Ramos and Jose Compean. Their crime: Shooting a drug dealer in the derriere, in the process of defending their countrymen. Of course, ordinary concrete would do just fine.